Celebrating a wedding for countless days and nights might seem a far-fetched concept to many, but around the world there are traditions that take celebrations of love and union far beyond saying ‘I do’. With ‘Grand Marriage’, Saudi director Faisal Al-Otabi provides a glimpse into the unique two-week-long wedding celebrations of those who call the Comoros Islands home. Produced by Al Jazeera Documentary Channel, the film unearths the tradition of the grand marriage, where nuptials are celebrated as much as 20 years into a couple’s marriage. Besides adding a sense of longevity to the union of marriage, the rite is a centuries-old custom that allows a couple to secure respect and heightened status in society. Throwing a humble wedding ceremony at the outset of marriage is a ‘temporary’ celebration – every man dreams of climbing the ‘love ladder’ and joining the elite group of well-regarded men. The film follows the preparations for the grand marriage of a middle-aged man who has two wives and seven children. He’s been saving money for decades, planning for this very special occasion, without which he could never be considered among his society’s elite, no matter how hard he worked or how important his profession. 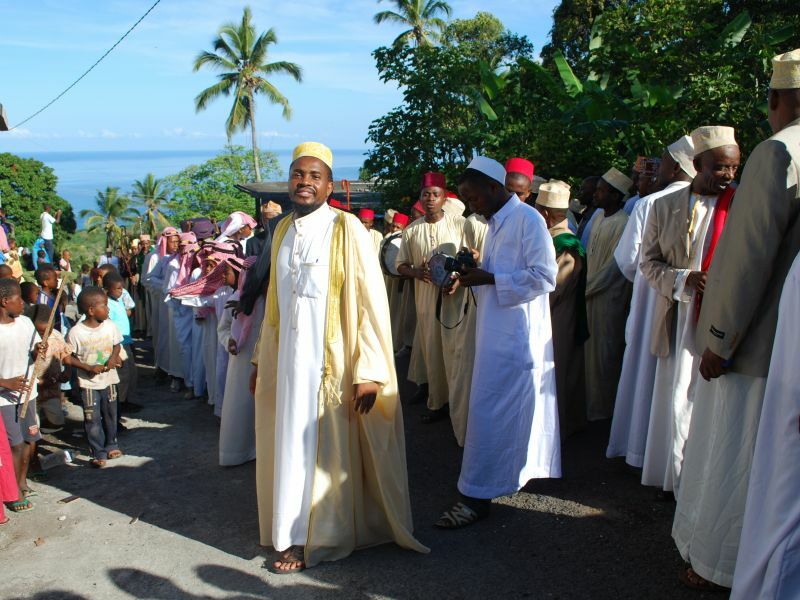 The ceremony is considered to separate the men from the boys and identify accomplished individuals; after it, a Comoran man is entitled to participate in his village assembly, and enter the community mosque via a special door. However, this status is often achieved after a lifetime of painful saving for an event that can cost as much as $40,000. Along with traditions like Comoran crafts and folk dancing, the celebration involves inviting the entire village to lavish feasts and exchanging expensive gifts. The economic pitfalls of these grand celebrations can have serious consequences. Many have condemned the ceremony for excluding people with modest resources from being eligible to participate in the island’s political life and how it sets the economic standards of the society’s future leaders. This is marginalised in the film, however, as Al-Otabi focuses on the ceremony itself, often repeating information and making much of the visually striking Comoran folk dances, as well as metalwork and folk songs – traditional cultural elements that the wedding tradition helps to preserve. But the hint of dissatisfaction with the tradition leaves the audience with unanswered questions, longing to know if there is more to the grand wedding than what is seen onscreen. The film would be more powerful if it explored the opinions of those who disapprove of this tradition and how it affects the dreams of the men and women who can’t afford to participate in it. Ultimately, ‘Grand Marriage’ is an attempt to penetrate a societal custom, but its modest style and flat overview only make it fit for a cultural highlight segment on television. A deeper reading of this lavish ceremony would explore the hidden struggle behind the joy.